Two Benson Road School photos with thanks to Pat Woodward Top one is dated 1938 can anyone date the other? 25/01/08 I was attending Benson Road Infants school at the time this letter was sent. I was six at the time so I can't remember receiving the letter and my parents are no longer alive to ask. I can therefore only presume that all the school children in the U/K received a similar letter from King George shortly after the Second World War ended. Thanks to Bob for the letter and photo. Benson Road School (Top End) 22/04/02 There used to be houses on the car park site,with a long gully running between the backs of the houses in Allens road and the school wall which went through to Bacchus Road. Thanks to Roger Dennelly for the information. Allen Hughes allen@ajhughes.fsbusiness.co.uk has added the following information. 24/03/2016. "I am second from the left on the second row from the front wearing the Mickey Mouse jumper. The guy on my right is Alan Gibbs, and 2nd to the left is Graham Field". Most of the school and teachers and escorts went to Rhyl for the day. On the return journey, the train was derailed at Waverton and two children, Catherine Clarke and Wayne Dandy, were killed. Injured members of the Party were taken to Chester Royal Infirmary and Wrexham Hospital, some being detained.The first part of the train continued the journey and some members, after being treated in hospital, were brought back to school by the Crosville Motor Coach Company. July 2, 1971 A school trip to the seaside ended in tragedy today when a train derailed near to Waverton, on the outskirts of Chester. Only two hours before the accident Chester's temperature was registered at 87 degrees, the highest for many years. The seaside special was carrying teachers and pupils back to Birmingham after a day trip to Rhyl. Two children were killed and scores of others injured when the last coach left the rails and overturned at Tattenhall Junction, shortly before 6.15pm. From there, it was a simple matter of trawling newspapers and I have decided that, where possible, it is probably more helpful and informative to quote directly from reported accounts rather than to compile my own version of events. My main sources are The Times, and two newspapers local to Chester, The Chronicle and the Observer. The first extracts are taken from The Times of Saturday July 3 1971. The front page report was headed: “Two killed as day-trip train crashes with 400 children on board”. Two children, a boy and a girl, were killed and five people were seriously hurt when a seaside day-trip train carrying 400 children and 30 adults was derailed after hitting a bridge near Chester yesterday. About 25 others were slightly hurt. The train, carrying children and teachers, mostly from Benson Road Junior School in Winson Green, Birmingham, was returning from Rhyl, North Wales, where the children had been on a day excursion. Police described the crash as a “major disaster” and 18 ambulances were sent to the area.Parents of injured children were taken from the Midlands to Chester by special train last night to see their children in hospital. Cheshire fire brigade sent fire machines, a breakdown vehicle and special cutting gear to the scene. Railway officials will hold an inquiry and a public inquiry is expected to be ordered by the Department of the Environment. More than 300 anxious parents waited in silence last night outside the Benson Road school for news of their children. Dozens of police attempted to answer questions. At one stage they brought blackboards out into the street and chalked up what sketchy details they had, such as the number of injured. Later, as the children arrived home, many mothers were weeping hysterically. Several children had cut marks and bruises and were crying.British Rail said last night that there were stretches of continuous welded rail on the line between Chester and Crewe, but it was not known whether the train was running on welded rail when the coaches were derailed. The Birmingham Post, of July 5th reported that five crash victims were still detained in Chester Royal Infirmary. They were Brian Law, aged 11, Margaret Hawkins, aged 11, Elsie Hobson, aged 59, Gladys Cross, aged 68 and PC Harold Coopey, aged 41. The more detailed report of the inquiry, published in the Observer, explained: The inquiry, called by the Department of the Environment, and conducted by Major C. F. Rose, Inspecting Officer of Railways, sat for five hours examining the circumstances in which two children died and 26 of their schoolmates, teachers and other passengers were injured when the last coach of a train carrying Birmingham children home from a day at Rhyl left the rails and overturned. Evidence was given of “rail creep” - a technical term describing a minute movement of rails along the sleepers which can cause the gaps especially left for expansion to close up. It was heard that rail creep was discovered on the stretch of line concerned as early as February but had not been remedied at the time of the derailment. Mr D. M. Howes, Chief Operating Manager, London Midland Region, said that on behalf of the British Rail Board, he would like to express his sincere regret for the accident and the fatalities and injuries that resulted. Mr Howes also placed on record the Board's sincere appreciation of the work carried out by the police, fire and ambulance services and the staff of Chester Royal Infirmary and Wrexham War Memorial Hospital. He also thanked other bodies and individuals who rendered assistance. A Service was held today in memory of the two children killed in the train accident last July. Police Inspector John Morgan and Police Constable Ronald Mountain presented to the school an Honours Board, given by Chester City Police and entitled The Catherine and Wayne Award for Good Citizenship. A girl and boy from the Fourth Year were chosen to receive the award and Mrs Clarke and Mrs Dandy presented silver medallions, on which their names will be engraved, to the two children. Their names will also be engraved on the Honours Board, which will remain in the school. A JUNIOR school in Birmingham played host on Thursday last week to two Chester Policemen. Inspector John Morgan and Police Constable “Rocky” Mountain know Benson-road Junior School because of a tragedy. Last July they were involved in rescue operations when a train carrying a party from the school back home after a day's outing to Rhyl crashed at Waverton. Two children - a 10-year-old girl and an 11-year-old boy - died after the accident. Last week in front of the assembled school Insp. Morgan and P.C. Mountain presented the "Katherine and Wayne Good Citizenship Board" to Miss Violet Legge, headmistress of the school who was also on the train 11 months ago. On the board - named in memory of Katherine Clarke and Wayne Dandy, the two children who died in the crash - will be engraved the names of a girl and boy chosen for the "good citizenship" in the school. The two children chosen will also receive a silver medallion. Also at the presentation in the crowded school hall were the parents of the two children who died. Mrs. Mary Clarke and Mrs. Anne Dandy, mothers of the two, presented the first of the silver medallions - which will be awarded annually - to Rosinna Sadiq and Suraj Prakash Lal. whose names will be the first to be engraved on the honours board. Our picture shows Miss Legge receiving the board from Constable Mountain. Also seen are Mr. K. R. Pilling, deputy Chief Education Officer for Birmingham, Mrs. Dandy and Mrs. Clarke, with Suraj Lal and Rosinna Sadig, Inspector John Morgan, of Chester, Constable M. Coopey and Supt. J. Barnes of Birmingham City Police. The Catherine and Wayne Award for Good Citizenship was held this morning. Among those present were the Lord Mayor and Lady Mayoress of Birmingham, the Chief Constable of Cheshire County Constabulary, Chief Inspector J Morgan and Police Constable R Mountain of Chester Police, the Former Mayor and Mayoress of Chester, Mr and Mrs J Smith, the Deputy Chief Constable of Birmingham, Mrs Hobson, Mrs E Stacey and the parents of Catherine Clarke. Pam and Ted recently heard from Colin Lawrence who was one of the recipients of the award in 1973 and has kindly allowed me to include photographs of his medallion. Colin was one of those who returned to Birmingham by bus after the derailment. The trip to Rhyl in 1971 had been a whole-school affair and it is highly likely that many of the children who had been involved in the derailment and who were still at Benson made a visit to Chester in October, 1973. According to a report in the Observer, it seems that when PC Mountain had visited Benson in July, he had been asked if a football match could be arranged between Benson children and some from Chester. This was agreed and the trip developed from there.There were precedents for arranging football matches. The Benson Log of 17th October, 1971, records: “Birmingham City Police `C' Division and West Bromwich Albion Football Club played a match in aid of the Catherine and Wayne Fund”. There is no indication of the result of this encounter! Miss Legge wrote, 2nd October, 1973: The school visited Chester Zoo this morning and Dee Point Middle School this afternoon and were welcomed by the Mayor and Mayoress of Chester, Councillor J Smith and Mrs Smith, Mr Harcastle HMI, Mr Lane, Director of Music for Chester, Mr Gordon Reeves, Chairman of Chester Education Committee, Mr Griffiths, Director of Education for Chester and Mr P McCabe, Head Teacher of Dee Point Middle School. Police Constable R. Mountain, of Chester City Police, accompanied the school party. During the morning, while the children were at the Zoo, the Head Teacher, Mrs Hobson and Police Constable Coopey of Birmingham City Police, met members of the Fire, Ambulance and other Services including the WRVS and Red Cross Society, to thank them for their help in July 1971. The Chief Constable was also visited at Chester Police Headquarters, where our thanks were conveyed and Chester Royal Infirmary was also thanked for help. Gifts were sent to Wrexham Hospital, as it was not possible to pay a personal visit in the one day. Both of the Chester newspapers carried detailed reports, with photographs, of this visit. One of the photographs shows Chief Constable, Henry Watson, being presented with a silver tankard by Miss Legge, accompanied by Mrs Hobson and Mrs Stacey. In April, 2004, I was able with the kind assistance of Inspector Nick Adderley, to photograph the tankard at Cheshire Constabulary Headquarters. It is inscribed: “Presented in gratitude from Benson Junior School Birmingham to the Chester Police for kindness and help on 2nd July 1971”. The photographs below show the tankard together with Inspector Adderley and Chief Constable of Cheshire, Peter Fahy. The Observer, 5th October, 1973, records: A party of Birmingham schoolchildren returned to Chester on Tuesday to meet some of the people and organisations who helped them when they were involved in a tragic train crash two years ago. Since the tragedy in Waverton a definite link has been forged between Chester and Birmingham, which culminated in the trip by train to Chester of over 200 children from Benson Road School, plus teachers, helpers and Members of the Education Committee. Some of the fourth year children had also been passengers on the train involving the accident, but for most of the youngsters it was just an exciting day out to a city very different from their own. A visit to Chester Zoo was on the agenda for the children and then the party moved to Dee Point Middle School, Blacon, who acted as host school and provided tea for the visitors. Mr Peter McCabe, headmaster of the school, and his staff entertained the party, and the children of Dee Point played netball and football with the pupils of Benson Road; organised a discotheque for them, and showed them the various activities at the school. Benson Road School presented Dee Point School with two trees in memory of the two children who died in the train accident. Constable Ron Mountain, according to everyone involved in the visit, had been responsible for the contact between the two places, and had arranged Tuesday's outing. He was quick to deny this, but from the thanks he received during the day, it was obvious that he had worked very hard towards the visit. We still have photographs of the visit, including the football match and the tree-planting ceremony. Unfortunately, some years ago, it became necessary for one of the trees to be replaced because it was in poor condition. However, the second tree still flourishes and has for some years been the focus of an ongoing study of the seasons by children from Dee Point. The origin of the trees only came to light as a result of this investigation.The invitation to Benson to visit Chester was reciprocated by Miss Legge. On 18th June, 1974, she wrote: Four hundred children from Dee Point Middle School, Chester, visited Birmingham today. They were met at New Street Station by the Head Teacher and representatives of Birmingham City Police and taken to the Police Center at Metchley Lane, Harborne, where a display of Police dogs and horses was given. They were then taken to Handsworth Park for a picnic lunch and spent the afternoon in school. After school they were taken to Ladywood Comprehensive School for tea and welcomed by the Lord Mayor, Councillor E.J. Eames, who, with the Lady Mayoress, his sister, Mrs Georgina Wheeler, went to New Street Station for their departure in the evening. When I was a young girl I was told that good will always come out of evil. The good of that tragic train crash has come in the wonderful kindness of the people of Chester. In all of this, I have been unable to discover any mention of the plaque presented, as a token of friendship, to Dee Point Middle School. There has been no indication of when or where it was presented, or by whom, who commissioned it or who made it. I have been in conversation with both Mr McCabe, Headteacher of Dee Point, and Miss Legge, and neither of them can remember anything about it. When I discussed the question with Ron Mountain, he told me that he still treasures what seems to be an identical plaque, presented to him as a token of friendship, but is unable to recall the occasion on which his plaque came into his hands. My understanding is that the plaques may have been made by someone in the Birmingham area, possibly a policeman, who had woodworking as a hobby. And although the Honours Board was given and presented by Chester City Police, it appears that it, too, may have had its origins close to Benson School. Additionally, it has emerged, after much searching by many people, that the whereabouts of the Honours Board for Good Citizenship is now a mystery. It is on record that the Good Citizenship Awards were made from 1972 until, at least, 1976. Someone in the vicinity of Benson must have been responsible for supplying the medallions and engraving them with the names of the children; who was this? Equally, ten children must have been presented with the medallions and we know of only three; who were the others? If anyone can shed any light on these matters I would be glad to hear from them. The quest for information about the plaque at Dee Point has been a rewarding one in so many ways. That it has thus far proved to be inconclusive has been more than compensated by what I have learned about Benson and the acquaintances I have been privileged to make during the process. It would be wrong to finish without acknowledging the guidance and contributions which I have been fortunate to receive from a range of interested professionals, and in particular from those teachers, librarians and the staff at Cheshire Constabulary H.Q. who were most helpful. I remain especially indebted to Pam Willis, Ted Rudge and Colin Lawrence, former pupils of Benson Road School, and to Ron Mountain, formerly of Chester City Police, without whose interest, support and encouragement this account would not have been written. Finally, a big `Thank You' must go to my wife, Linda, and her colleague at Dee Point, Ron Lalek, who posed the questions in the first place. At the time I was bringing this account to a conclusion, I spoke with a former Dee Point teacher who, I recently discovered, had joined the staff in January, 1974. She was not, therefore, at Dee Point at the time of Benson's visit to Chester but had heard of it. She told me of a book, possibly about Birmingham, which she says had been presented to the children and staff at Dee Point by the children and staff of Benson. Apart from the visits of October, 1973, and June, 1974, I know of no other formal contacts between Benson and Dee Point and it therefore seems probable that the presentations were made on one or other of these occasions. The fact that we are now given the impression that the inscribed book existed before January, 1974, suggests to me that this might have been presented in October, 1973. The plaque may have been presented at the same time or, as now seems more likely, in June, 1974, in Birmingham. Could it be that Benson pupils were involved in the presentations? I wonder if anyone can remember being asked to take part? BENSON ROAD SCHOOL 20/08/06 I have just read the sad news that Dennis Corrigan, former teacher at Benson Road School (1968 - mid 80's) has passed away, his funeral is at Lodge Hill Crematorium on Tues 15th Aug at 1.30pm . Thank's to Sandra Rees for letting us know. Class photo circa 1951/2 taken at Benson Rd junior & infants school. I can still remember a few of the pupils names but not the teacher. Can anyone else put names to the faces, my name is Pete Ellis and l'm standing back row centre dressed in black. BENSON ROAD SCHOOL by Stuart Waldron 25/04/02,Stuart states Miss Dumealow was Head Mistress, she, as far as I know, was never head mistress during that period of time, she used to take topclass in the juniors, I know that for a fact as I was in her class during my last year. Miss Legge was head mistress when I started and still head mistress when I left. BENSON ROAD SCHOOL 17/10/02 Photograph taken in the playground 1938 / 39 the ocasion was either Commenwealth or British Empire Day. Another Benson Road school photograph sent in by Barry Broadbent. Barry is sitting on the floor front left. Can anyone tell what year the photograph was taken? or put names to the other pupils and the teacher? *Note Barford Road is in the Rotten Park District but a lot of people from Winson Green went to school there. ROW 4: BERNARD (BUNNY) PRESSDEE, ALLAN HALL, JOHN ROBINSON, TONY PARKES, T. BACH?, MALCOLM READ, KENNY DURRANT, TONY LOVERIDGE. ROW 3: DAVE BAYLEY, DAVID CLOVES, JOHN ALLEN, TONY CROOK, TONY ROBINSON, HAROLD EVANS, CHARLIE (DINKY) NEATH, MAURICE CRUICHSHANKS, N/l . ROW 2: N/l, J. FENSOME, M. PEACH, TONY DEAN, ? DEAN (TWINS) , KENNY MILES, N/l, N/l, JOHN CLARSON?, DA VID LONGSTAFF. ROW 1: EDWIN CLAYTON, ROY COX, N/l, N/l, (TEACHER) F.J. MARTIN, JOHN CLEWLEY, MALCOLM WHEELER, N/l, H. BRIGHT. FLOOR: ALLAN TAYLOR, JOHN ONIONS. D.Prichard, M.Peach, AHall, C.Callow, KDurrant, R.Colloff, M.Cruickshanks, M.Wheeler, D.Bayley, R.Beech, ADuthie, W.Lucy, RPerks, C.Scott, J Rose, T.Moxley, T.Strain, M.Walker, A Harris, S.Parker, T.Beard, D.Robbins, C.Crook, AJones, J.Freer, KOrgan, W.Mellor, J lHanson, B.Kirkham, J Davies, ANorth, C.Mould, AMincher, M.Crathorne. KSutton, D.Nobbs, AScott, J.Haywood, H.Lowe, E.Clayton, J Robinson, M.Read, KHodgson, D.Cloves,A Robinson, A Dean, M.Renar, J.Lenton, A Lawrence, R Downing, K Moss, A Wilkins, B.Brusch, RHumphries, B.Phillpots. L.Ward, F.Benson, T.Newbery, P.Cox, J.Glass, RCox, J Howes, T.Willetts, B.Daniels, H.Castello, W.Harris, C.Neath,J Gresty, ACummings, D.Clarke, V.Stephens, E.Varney, D.Breakwell, G.Pickering, T.Westwood, A Lester, G.Layton, RCollins, L.Bird, D.Hood, A Edge, D.Bridle, M.Barton, J.Perry, D.Longstaff, KMiles, T.Bach, J Clason, AParkes, J Fensome, L.Oldershaw, KRead, D.Bowen, V.Hill, J Clewley, J Gardener, R Pearshouse, A Crook, H.Bright, J Allen, B.Pressdee, A Taylor. Barry Sutton ( 1951-55 ) Skating at Wembley 1st in Open Challenge Trophy for dancing ( with partner ). 2nd ( silver medal ) - Individual Championship ( B. Isles ). Back row left to right: Mr.Edkins, Alan Lowe, Tony Parkes, John Robinson, Donald Robbins, Dennis Nobbs and Mr. Birch. Second row: Kenny Sutton, D. Beard, Les. Ward, Harold Evans, Terry Willetts and John Flint. Seated: Bobby Nash and Tony Crook. Photograph and names supplied by Tony Parkes. Back row left to right: Eric Perry, N/l, Allan Lowe, Les.Ward, Bob Nash and B.Moore. First row: Mr. Birch, John Morton, Ray Pearshouse, Tony Parkes and Mr. Hepburn. Photograph and names supplied by Tony Parkes. My mom went to Barford Rd school which is on the border of Winson Green and Rotton Park. At the time she lived at No 54 Winson Street Winson Green when she left school in 1922 she was 14yrs and 55 days old. Best Wishes Clive Roach. Head Teacher Mr Wilcox then Mr Griffin. Next Row L-R: ? , ? ,Eric Martin , ? ,?, ? , ? , Norman Causer, Alan Miles , ? , ? . Next Row L-R: ? , Roy Johnson, ? , ? , ? ,Alan Bishop, Ronnie Warrilow , ? , ? , ? , ?. Next Row L-R: Stanley Beard, ? , ? , ? , Mr Wilcox (Head Teacher) , ? , ? , ? , ? . Front Row L-R: ? , ? , Ronnie Lawrence, ? , ? , ? , ? ,? . Back Row L-R: Mr Oscar Allen (Trainer), Stanley Beard, ?, Ron Willets, Jeffery Sanders, ? , ? , ? Front Row L-R: Alan Miles, Kenny Warrilow, ? , Ronnie Allan, Jonny Scrannage, ? . DUDLEY ROAD SCHOOL. renamed "Summerfield Centre"
Dudley Road School a grade 11 listed building the oldest school in Winson Green (STILL STANDING) was built by the Birmingham School Board in 1878 and designed by Martin and Chamberlain. I would like to leave a message on your school site but am un sure how to do so could you help. My name was Delia Gould and I went to Foundry Road School and Handsworth Road School from 1947-1955 or there abouts. I remember Mavis Rudge, Nora Johns, Valerie Reap, Jean Meluish anybody who remembers me please get in touch with me at dwoodwardbennett@yahoo.com. Babs Jenkins, sylvia Deakin, Jean Pugh, D Smith. Third Row John Lissemore, Gordon Bradley, John Edwards, Ron Smith, Frances Erry,Ruth Jackson, Doreen Barrett, Alec Jilkes, George Stockley, Harold Green, J Stokes, Denis Padget. Cliff Mears, Roy Bickley, Ray James, Dennis Evans, Bernard Smith. Sitting on floor L-R Alan Keith, Gordon Brindley, ?, Cyril Rotheroe, ?, ?, Ron Hardeman, --- Jukes. Photograph thanks to Dennis Evans. Seeing the picture of Foundry Rd. school dining hall brought back not very fond memories of the time in the late fifties when my mother Betty Ashford worked there as a cook. I remember making the long walk down Winson Green Rd. with my two sisters during the holidays when the school was open to pupils who received free dinners. We had our dinner with them and I remember the mothers standing along the wall with other children and babies waiting to be fed should there be anything left (which there always was).These children would have gone hungry without the service that was provided by the school and was my first insight into the poverty that existed in the area in which I lived. Thank you for providing us with such a wonderful site in which to share our stories. 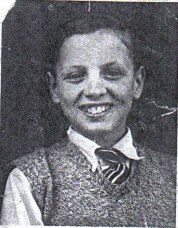 L to R; Maurice George Baker went to Foundry Road School, in 1947 age six. Malcolm Danold Baker went to Foundry Road School in 1950 left in 1955 and he also went to Handsworth New Road School and left in 1960. David Winston Baker went to Foundry Road School in 1947 left in 1953 and went to Handsworth New Road School and finish there in 1958. My mother Daisy Cherrington lived at 81 Foundry Road and attended Foundry Road School were she was awarded the medals for perfect attendance. The silver medal says awarded to Daisy Cherrington 1904, for eight years perfect attendance. The bronze top left is 1902. The bottom bronze is for 3 sessions of perfect attendance at evening classes. The jeweler is P. Vaughton & Sons Gothic works, Birmingham. The photograph is taken in the infant's playground, the houses in the background are in James Turner Street. The school buildings on the left are the infant's classrooms. The teacher is the very kind and charming Miss Dunn who guided us through our first year in the juniors. I still have a propelling pencil she gave to me, converted from a rifle bullet. Back row L-R: Joyce ?, Rita Jelly, Sylvia Baddeley, David Elliott, Alan Day, Diane Woodman, Royston Brazier, Joey Miles, Raymond Crump, Annette Johnson, Linda Sadler, David Woodman & Michael Williams Second Row- L-R: Gloria Jelly, Maureen McBride, Helen Waite, John Varley, David Lowe, David James, Brian Bant, Pat Stansby, Val ? & Linda Jones Third Row L-R: Sandra Davies, Susan Holmes, Barbara Holmes, Pamela Ingram, Tony Vincent, David Halford, ? Bellefield, Robert Taylor, Keith Whitehouse, Martin Hewitt, James Holloway, Roger Brown & Michael Devaney Front Row L-R: David Durose, John Farrington, Michael Davenport, the twins are Norman and Leslie Bradshaw with Graham ? in between. Linda Jones was my dancing partner. Alan Day contracted polio and was removed from school, we never found out if he recovered, I hope he did. John Varley lived in Preston Road and amazingly for the time his dad built his own car called the Varley Special. David James lived in Magdala Street and his dad ran a large mobile grocery van with his name embellishing the sides. Keith Whitehouse was the caretakers son, his house being in Perrott Street. The class shows 42 pupils, numbers not a problem for teachers in those days. Other names in the same year who I remember are John Weston, Dennis Brassington, Edwin Averill, Peter Shakeshaft, Max Lloyd, Margaret Armstrong, Brenda Blaine, John Watson, Colin Dovey & John Grinham. This is all you received at the end of each year. The comments and results are entirely handwritten by Miss Powell who was our teacher for 2 consecutive years, those were classes 3/1 and 4/1. I remember being very pleased when I heard she was to be my teacher purely because she was young and a woman. Apart from Miss Dunn my only other teacher in the juniors was Miss Wastell, class 2/1. She was considered quite old and had a stern countenance, but my mom said that I learned more in her class than at any other time in school. The headmistress's signature, Miss Moyle, is a rubber stamp, high tec. in those times. Christmas party, in I would guess 1955 or 1956. On this photo I'm the one on the far left, back row holding something, directly under the letter H.
left, they are from left to right: Andrena Pell, Jillian Patterson and Brenda Dovey. Martin Hanchett CAN YOU NAME THE OTHERS. Back Row L to R.Michael Bubb, Gloria Blaine, Stanley Watson, Sheila McNabb, Bill Devaney, Linda Garret, Maureen Hickens, Michael Kench, Valerie Inett, John Armstrong, John Jenkins, Pat Simcox. Next Row L to R. ?, ?, ?, Margaret Vincent, David Chapman, ?, ?, Pat Frost, ?, Ann Simms,?. Front Row L to R. ?, ?, ?, Keith Wood, Tommy Hudson, David Harris. Two Girls Sitting. Joan Reeves , ?. Can you help David to fill in the missing names please send them to us. FOUNDRY ROAD SCHOOL 01/09/05 One of the little girls on the floor with the sandles on, to the left of the picture is me Joan Reeves. FOUNDRY ROAD SCHOOL The school photo was taken at Foundry Rd.school 1950/51. I am sitting on the front row on the right of the group I am the one wearing white pumps. Clive Roach. Can anyone fit Pat Reynolds in the photo she was displaced by Stella Turnock ???? FOUNDRY ROAD SCHOOL Photograph Foundry road school 1949/50. The missing names . back row. First position on left is John Deacon. 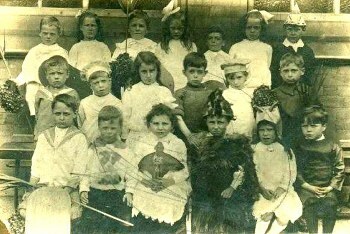 Second row.Third from left is Veronica Nicholson. Third row. Third from left Brian Wheeler. Fourth row. girl sitting on right hand side is Margaret Greenaway. I had a fantastic time at Foundry Road School.great memories. Floss is on the photo, she is the girl to the right of the two girls in the centre of the photo holding the flowers. Photo of Red Team? Foundry Rd School 1949/50 Back row LtoR Alfred Freeth,Pat Frost, Clive Roach, Billy Devany, Valerie Barley, John Deacon. Christine Turton (neeNewman) is first on left. FOUNDRY ROAD SCHOOL I was just breezing through the internet and through some whim I looked up my old school, Foundry Road Juniors. I was there from 1951 to 1954 and remember Miss Moyle, Headmistress, as if it where yesterday. I recall the school having a commerative garden built for the coronation and I think that the school picture was for the opening of that.I can't recognize me in the photo, I was one of the few kids who wore glasses. How important those formative years were and at that time the school had pretty good standards. In my case it led on to doing well in business living and working in Australia, New Zealand, Malaysia, Canada and the US. I now live in San Diego California where I own my own wine importing company. Not bad for the kid from Markby Road and due in no small means to those years at Foundry Road. FOUNDRY ROAD SCHOOL CRICKET TEAM YEAR? Back row. John Armstrong, ?, David Harris,?, Barry Griffin, ? . Front row.? ? David Grinham ? ? Thanks to Clive Roach for supplying the names can anybody please help with the others.